When I responded that the “fact that some Arabs were recruited for the Allies doesn’t make Arab Nazi collaboration a ‘myth,’” a heated exchange ensued. Ibish countered that while there were only few Arab Nazi collaborators, there were “HUGE numbers of Arabs who took up arms against Axis forces.” He proceeded to cite specific numbers, claiming e.g. that “9,000 Palestinians enlisted in the British army during the war,” and while he did not link to any sources, Ibish definitely does not deserve to be suspected of making up his own facts. However, even if one assumes it is correct that 9000 Arabs from British Mandate Palestine enlisted in the British Army, this number is dwarfed by the 30,000 Jewish volunteers from British-ruled Palestine who served with the British forces during World War II. In addition, Jewish refugees who had escaped Nazi-controlled areas in Europe also volunteered to join the fight against Hitler’s Germany. Altogether, some 1.5 million Jews fought in the regular Allied armies – which is to say: roughly 10 percent of the global Jewish population in 1940. Of course, by the end of World War II, some six million Jewish civilians had been murdered by the Nazis, and a quarter of a million Jewish soldiers had lost their lives fighting with the Allies. Given that I did my Ph.D. on a somewhat related topic – US intelligence on Germany during the 1940s – I’m not quite as unsophisticated as Ibish seems to assume. I doubt that there are reliable studies about how Arabs and Muslims in general felt about the Nazis during World War II, and given that countless millions of Arabs and Muslims lived in great poverty and had very little education at the time, many likely knew too little to have an informed opinion. 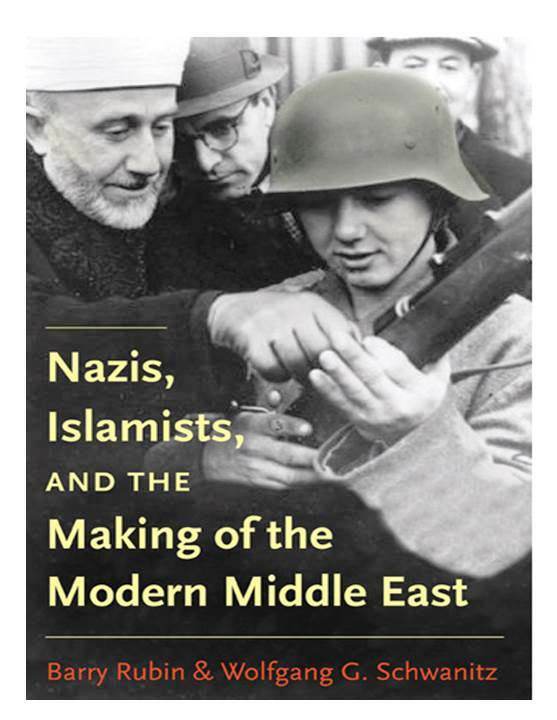 However, we do know that the Nazis invested considerable efforts to appeal to Arab and Muslim audiences through broadcasts and other propaganda, and several scholars have made a convincing case that the poisonous legacy of this propaganda and the collaboration between the Nazi regime and some Arab leaders lives on in the Middle East. So while it is obviously true that Arab and Muslim forces participated for various reasons in the Allied efforts to defeat Nazi Germany and the Axis powers, it is unfortunately also true that the ideologies developed by Arab and Muslim Nazi collaborators and sympathizers have remained deeply entrenched in the Middle East throughout the seven decades that have passed since D-Day. But unfortunately, such very different standards are also applied when it comes to the legacy of Nazism in the Middle East. In Europe and the US, no group that identifies with a text even remotely resembling the Hamas Charter would stand a chance to gain any political legitimacy; yet, when the Western-supported Palestinian Authority forms a “unity government” with Hamas, there is no shortage of analysts and politicians who argue that this is acceptable because after all, Hamas has a sizeable constituency among Palestinians and if they don’t mind the unmistakable echoes of Nazi ideology in the group’s charter, everyone else should be willing to along with it. But while al-Husseini continues to be hailed as a Palestinian hero – including by Mahmoud Abbas –, a Palestinian professor who earlier this year dared to take his students to Auschwitz was threatened and vilified and eventually resigned his position. As these and countless other examples illustrate, even if sizeable Arab and Muslim forces helped to defeat the Nazis 70 years ago, the Nazi legacy in the Middle East still needs to be defeated. This highlights a fact that is too often ignored: while Nazi Germany was defeated in 1945, Israel’s Jews still had to fight Nazis – not just Nazi sympathizers – years later. 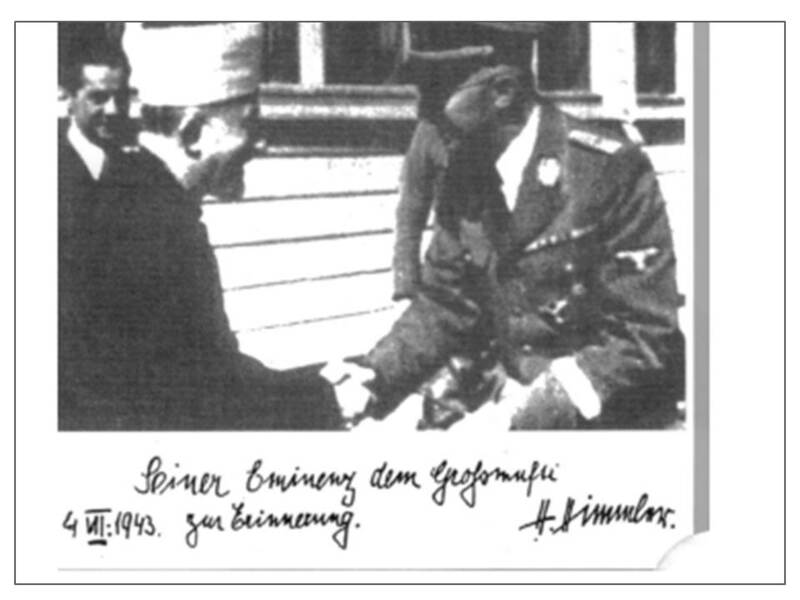 Another example I noted in a recent post concerns a group of some 40 Bosnian Muslims – veterans of the units “Hitler’s mufti” al-Husseini had recruited for the Nazis – who fought in Jaffa in January 1948. As I’ve shown repeatedly, there is plenty of evidence to conclude that a majority of Palestinian Arabs regarded al-Husseini as their leader in the years after his return from Europe, and it is an indisputable fact that he continued to play a leading role in the Islamist movement for decades. 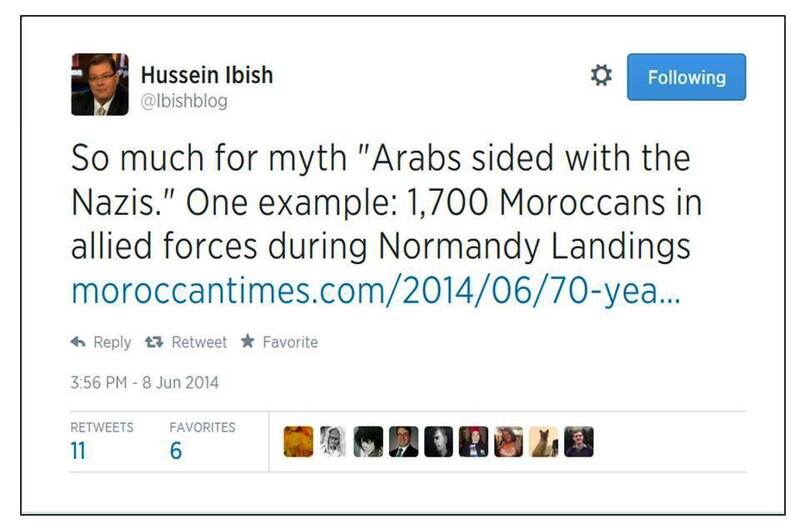 Unfortunately, Ibish is also wrong to claim that Palestinians no longer see him as a significant historical figure. Palestinian Authority President Mahmoud Abbas explicitly honored al-Husseini in speeches he gave in 2010 and in 2013. Note: I just came across a very interesting and relevant review of a book by Derek Penslar, Jews and the Military: A History, Princeton University Press, 2013. In the past few weeks, several reports highlighted the vitriolic backlash that followed a visit by a group of Palestinian students to Auschwitz at the end of March. The controversial visit – apparently the first of its kind – was organized as part of a joint program on Reconciliation and Conflict Resolution with the Friedrich Schiller University in Jena, Germany, and Ben-Gurion University of the Negev and was led by Al-Quds University professor Mohammed S. Dajani. Quite obviously, this student remained completely unaware that when Palestinians visit a Nazi death camp, they have no reason to feel like detached spectators for whom it is somewhat “strange” to come. On the contrary, when Palestinians visit a Nazi death camp, they are following in the footsteps of the man who is nowadays sometimes referred to as “Hitler’s mufti,” and they have the chance to understand what this Palestinian ally of the Nazis saw and what he envisaged for the Middle East after the Nazi victory he hoped for. To His Eminence the Grand Mufti as a memory; 4 VII: 1943; H.Himmler. This was obviously good news for al-Husseini. While the Nazis were initially content to solve their “Jewish problem” by driving Jews out of Germany and German-occupied areas, Rubin and Schwanitz argue that the importance they attached to their alliance with the Palestinian mufti was one of the factors that led to the adoption of the “Final Solution:” since al-Husseini wanted the Arab lands he intended to rule as “judenrein” as the Nazis wanted Germany and Europe, the Nazis had one more reason to conclude that it was in their interest to begin the systematic killing of Jews. But not everyone is impressed with Bartana’s record as an artist and her awards: writing in “Die Welt,” Alan Posener observed sarcastically that any Israeli artist in search of a business plan that can work irrespective of talent should consider Israel-bashing as a safe choice. What irked Posener in particular was Bartana’s entirely predictable attempt to employ all sorts of worn-out slogans and clichés to endow her project with a supposedly deeper meaning. “the Third Reich and the Holocaust are not just historical events – they also have long-term global chain effects that reach into the present day. Not only is the founding of the State of Israel based on a UN-decision such a consequence, but so is the Palestinian “Nakba” in 1948. As are escape and expulsion in Europe and the Middle East […] This history is written, but the future depends on our acting. Bartana also repeatedly highlighted the murders and other crimes committed by a small terror group that called itself “National Socialist Underground” (NSU). The group may have had a handful of supporters, but it consisted of only three known members and seems to have been active between 2000 and 2011, when two of the terrorists killed themselves as they were cornered by police after a bank robbery. The group’s only surviving member turned herself in and is awaiting trial. Of course you have to argue that “it is not about numbers” if you want to claim that a terror group consisting of three people and perhaps a few dozen supporters constitutes “an active fascist movement in today’s Germany” and represents “an ideology that still is alive” – even if two of the terrorists are dead and the third one is in custody awaiting trial. To be sure, the fact that the terror trio could carry on for years and commit a series of murders targeting mostly immigrants reflects a spectacular failure of German law enforcement and security agencies. But the existence of such a small group in a country of some 80 million people does not indicate that Nazism and fascism are “alive” in Germany. However, there are other reasons for concerns about the legacy of Nazism in Germany – which can of course be conveniently ignored by somebody like Bartana who isn’t interested in numbers. Consider for example the findings of studies showing that at least 20 percent of Germans harbor antisemitic attitudes, and that more than 40 percent of Germans endorse antisemitic “criticism” of Israel such as comparing Israeli treatment of Palestinians with the Nazi treatment of Jews. If I could have joined “Tapfer im Nirgendwo”, I would have played the famous recording of survivors of Bergen Belsen concentration camp singing HaTikva shortly after the camp’s liberation in April 1945. First published on my JPost blog on June 29, 2013. In a recent article on the now widely debated antisemitic rants by Mohammed Morsi – recorded in 2010, well before he became Egypt’s president – Barry Rubin rightly criticizes that there is a tendency to pretend that we are just dealing with some “isolated acts” and that by now, Morsi’s views might have changed. 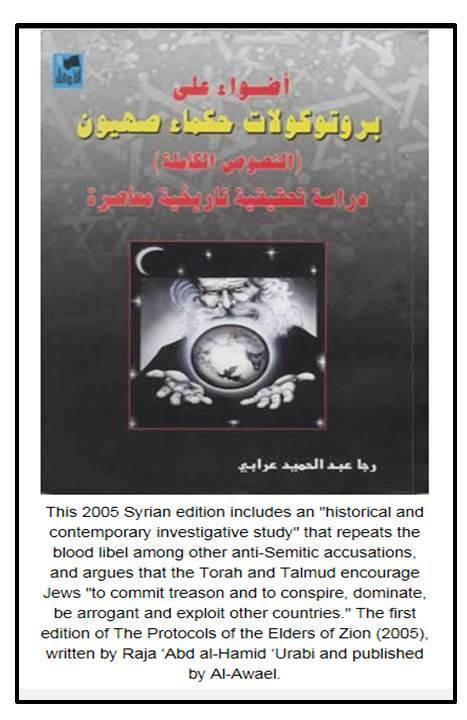 While this kind of wishful politically-correct thinking is unlikely to change no matter how much evidence is available to counter it, MEMRI recently provided translated excerpts from a very interesting article on precisely this subject by Lebanese liberal Joseph Bishara, who pointed out that Jew-hatred is a basic principle of the Muslim Brotherhood’s “philosophy.” This is of course exactly the same assessment as the one offered by the widely respected Syrian-German scholar Bassam Tibi in an interview that I quoted a year ago. “Needless to say, tolerance toward the other has no place in the MB’s agenda. Therefore, how can certain people assume that the MB is tolerant of Jews? The MB is racist and hates the Jews and anyone who believes in Judaism. This is an uncontestable part of its creed and is reflected in extremist directives that appear in the writings of its greatest thinkers. “This hatred did not emerge in the 20th century or [after] Israel’s establishment or the occupation of Arab and Palestinian lands by Israel. This hatred is historic, with roots going back to the inception of Islam. The MB bases its hatred of Jews on the Koranic verse: ‘You will surely find that the most intense of people in animosity towards the believers are the Jews and the polytheists… ‘ [Koran 5:82]. “The MB’s position on the Jews is evident in the interpretation of this verse by Sayyid Qutb, who said that the Koran placed the Jews before the polytheists because they had been more hostile to the Muslims throughout history. Qutb also stated that contrary to what moderate Muslims claim, the Koranic description of the Jews is unchangeable and is not dependent upon [circumstances] of time and place. The notion of a divinely ordained “eternal” hostility between Muslims and Jews is indeed exactly what the influential cleric Yusuf Qaradawi is preaching. “The MB’s position on the Egyptian Jews is no different than its position on Jews in general; it is the same animosity and hatred. A document titled ‘The MB and the Jews,’ penned by ‘Abdo Mustafa Dsoky for the MB’s Wiki [ikhwanwiki.com], claims that MB founder Hassan Al-Banna gained fame due to his essays on the character and hidden traits of the Jews. If it was a western president or prime minister – let alone an Israeli one – who had made utterly bigoted and hate-filled remarks about Muslims not long before he took office, it sure would be a top news item all over the world. But when it turns out that some two years ago, the man who is now Egypt’s president called “the Zionists” “blood-suckers,” “warmongers,” and “the descendants of apes and pigs,” most of the mainstream media (MSM) seem to think it should be politely ignored. In a way one could actually argue that this really isn’t newsworthy, because if the MSM accurately reported on Islamist ideology, everyone would already know that implacable Jew-hatred is an integral part of the Muslim Brotherhood’s views and agenda. After all, Morsi’s statements from 2010, which were recently translated by MEMRI, faithfully echo themes that are all too familiar from the Hamas Charter, and similar views are regularly propagated by well-respected Muslim scholars. The question why this torrent of loathsome statements by influential and widely respected figures who clearly shape and represent mainstream views is studiously ignored in the MSM was recently addressed by Pat Condell, who focused on the Palestinians and argued that this kind of “political correctness” reflected a patronizing and ultimately racist attitude. While I largely agree with Pat Condell’s broader argument, I think there are also other important factors at work – first and foremost perhaps the western mantra that other societies should be approached as “people like us.” The problem with this approach is that, while it is always true on an individual level – we can meet people we personally like and get along with anywhere –, it is not true for societies. A society where the reactionary and bigoted views of Islamists like the Muslim Brotherhood are mainstream is simply not like a society where it is mainstream to reject and even loathe comparably reactionary and bigoted views. German prize award committees seem to have a weak spot for outspoken Jewish critics of Israel: writer and activist Uri Avnery has accumulated multiple German awards over the years, and the staunchly pro-Palestinian attorney and activist Felicia Langer was awarded Germany’s Federal Cross of Merit, First class, in 2009. Now it is the turn of Judith Butler, an American philosopher and professor in the Rhetoric and Comparative Literature departments at the University of California, Berkeley, who will receive the prestigious Theodor Adorno Prize on September 11 in Frankfurt. To be sure, the Adorno Prize is awarded to “acknowledge outstanding performances in the fields of philosophy, music, theatre and film” – which is to say that it is Butler’s academic work, and not her political activism that are being honored with the prize. However, it is obviously Butler’s academic fame and her status as the “reigning queen” of Queer Studies that make her activism very valuable to her political allies in the BDS-movement that targets Israel. Critics who argue that it is therefore disingenuous to pretend that Butler’s contribution to philosophy can be honored irrespective of her political activism obviously have a point. How completely inane this view is will be readily apparent to anyone who has ever glanced at the Hezbollah or Hamas Charters, and there is arguably a strong case to be made that somebody who is able to see anything “progressive” in groups that define themselves in the most reactionary religious terms and advocate an unbridled Jew-hatred should automatically be disqualified from winning a prize named after Adorno. And how come that somebody who evokes such a family history has nothing to say about the Jew-hatred espoused by Hamas and Hezbollah, and their acknowledged ideological sponsors, the Muslim Brotherhood and the Iranian regime? How come that somebody who evokes such a family history would eloquently speak out in favor of boycotting Israeli universities, but would have no problem to lecture at Birzeit University, which has a well-earned reputation for fostering extremism? One former student of Birzeit University is Ahlam al-Tamimi, the exceedingly proud collaborator in the Sbarro restaurant suicide bombing whose release in exchange for Gilad Shalit was publicly celebrated by the Islamic bloc at the University of Birzeit. Adorno prize winner Judith Butler can only imagine to speak at Tel Aviv university once it is a “fabulous bi-national university,” but she has no problem lecturing at Birzeit University, where Ahlam al-Tamimi is a much admired celebrity. I was curious to learn more about her speech and the context of this statement, and while I couldn’t find an official recording or transcript, some of the bloggers who were in the audience provided their own partial transcripts or summaries. 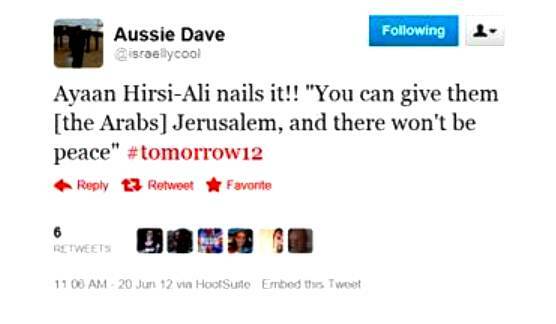 According to Levenstein, Hirsi Ali’s remark about Jerusalem came as response to suggestions for peace-promoting measures by veteran US Middle East expert Dennis Ross. In her presentation, Hirsi Ali had focused on three characteristics that she described as deeply embedded in Muslim societies: the absolute and unquestionable authority of the usually male power figures (e.g. father, husband, teacher, policeman, president); the dominance of a pride vs. shame paradigm and the related notion that the willingness to compromise is a sign of weakness; and the conviction that religious texts like the Koran and the Hadith offer solutions to every conceivable problem. “Cleverly, and unlike her co-speakers Ashkenazi, Ross and Wieseltier, Ali didn’t mention the Palestinians once. Yet, her entire talk centered on the Palestinian issue. Only winners and losers? Principle of non-compromise? Islamists? Listening to her talk, it would be easy to believe that secularists readily compromise, and that talking to Islamists is useless, even though both of these ideas have proven false. If we replaced in Ali’s speech […] “Muslim” and “Islamist” with “Jewish,” she would have been called anti-Semitic. [Kadri] “The idea that jihad can be a military struggle has always been around. There are at least four types of jihad: jihad of the tongue, hand, heart and sword. But jihad of the sword gets a new spin in the 14th century through Ibn Taymiyya, when the idea that you could defend yourself against the invader becomes important for the first time. After the Mongol conquest of Baghdad in 1258, this new idea of jihad as self-defense emerges, primarily through Ibn Tamiyya. It is then revived in response to foreign rule − during the 18th-century Saudi rebellion against Ottoman rule, for example, in the context of Muslim opposition to the British in India, and then in the context of resistance by Hassan al-Banna [founder of the Muslim Brotherhood] in the ’20s − which gets us toward the Zionist issue. Because as far as the Muslim world is concerned, Zionism is just another form of colonialism. Now I know that this is very contentious in Israel. But this is how it’s perceived in the Muslim world. And after 1948, all these interpretations of jihad evolve again, as a new idea takes hold. Jurists have historically characterized jihad as a collective obligation that must be directed by a Muslim ruler, to safeguard against freelance jihadis. But post-’48, that limitation falls by the wayside. When the Arab countries fail to stop Israel, they lose legitimacy. And what you get subsequently is a whole bunch of individuals and groups who take it on themselves to fight the jihad − who say it’s a personal obligation, binding on everyone, regardless of caliphs or rulers. [Question] From a religious point of view, do you think it would be possible for a majority of Muslims, as Muslims, to accept Israel? [Kadri] Well, the jurisprudence of jihad does contain the idea that a land that was once Muslim can’t be given up. That’s what the hard-liners draw on. But that’s been palpably ignored at times. Andalusia was once Islamic, but those extremists who might argue for its recapture today represent a minuscule minority. And though there are huge disagreements over the precise political compromises that Muslims can properly reach with Israel, Islamic jurisprudence does recognize the concept of the hudna, a truce. It allows for peace of limited duration, which can be renewed indefinitely. That’s how the Camp David Accords were given a religious imprimatur by clerics of Al Azhar in the late 1970s, for example. Insofar as there are people in Hamas who support truces, they also justify them on those grounds. So here you have it: a “respectful” view of Islam’s stance toward the Jewish state boils down to the stance of Hamas – a truce or “hudna” can perhaps be negotiated for 10 years, and maybe it will be extended, but that would require “corresponding gestures from Israel.” In other words, Israel makes concessions when the “hudna” is first negotiated, and then every 10 years when it needs to be extended. Kadri points to the optimistic scenario that this “would potentially allow the benefits of peaceful coexistence to become more apparent on both sides” – but potentially, there is of course also the pessimistic scenario that Hamas leaders mean exactly what they say when they declare over and over again that they will never recognize Israel. And who knows, maybe Egyptian supporters of the Muslim Brotherhood are resolved to demand the realization of the promised “United States of the Arabs” whose “capital shall not be Cairo, Mecca, or Medina. It shall be Jerusalem, Allah willing.” And maybe the many millions of followers of Sheikh Qaradawi share not only his conviction that Muslims and Jews are destined to fight each other, but also his hope that “the believers” will finish what Hitler didn’t accomplish. 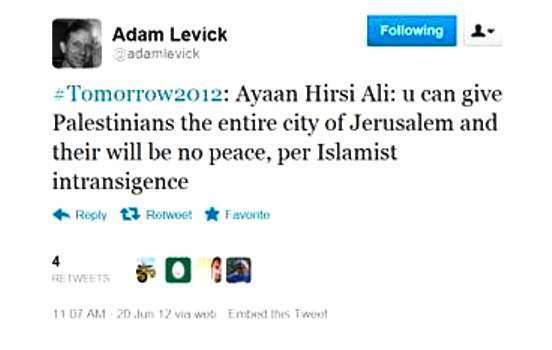 As long as leading Muslim figures can propagate ideas like these without encountering widespread criticism and opposition in the Muslim world, Ayaan Hirsi Ali has a solid case for her sweeping criticism of Islam and she is right to warn Israel against naive hopes for peace as long as Islamists enjoy enormous popularity and support. A stunning clip made available by MEMRI documents an Egyptian rally to launch the presidential election campaign for Muslim Brotherhood candidate Muhammad Mursi. Egyptian cleric Safwat Higazi, who addresses the crowd, promises that Mursi and the Muslim Brothers will realize “the dream of the Islamic Caliphate” by “restoring” the “United States of the Arabs” with its capital Jerusalem. According to a report in the Jerusalem Post, the rally took place in a Cairo soccer stadium with presidential candidate Mursi and other Brotherhood officials present; they are shown in the clip nodding in agreement with Higazi’s speech. Let’s hope that all the assorted “experts” and pundits who never grow tired of telling their audiences how “moderate” and/or “pragmatic” the Muslim Brotherhood really truly is will indeed take the time to listen carefully to this message. If it is some obscure village preacher who comes out with such horrendous proposals, it would be perfectly reasonable to conclude that this incident was not really relevant enough to report on. But I think it is fair to say that even when notable Islamic clerics issue such statements, they rarely receive prominent news coverage in the West, despite (or because of?) the fact that this is arguably a very newsworthy item because it highlights the radical difference between discourse in the Islamic world and the West. So who is Muhammad Hussein Yaaqub? A paper entitled “Salafists Challenge al-Azhar for Ideological Supremacy in Egypt,” originally published in September 2010 in Terrorism Monitor (Volume: 8 Issue: 35), describes Yaaqub (Yaqub) as a “very famous” Salafist preacher “with experience in teaching and preaching in some Gulf countries.” The paper also provides a link to his website (in Arabic: www.yaqob.com); and apparently, Yaaqub even has a Facebook page –which goes to show that a preference for barbaric medieval “justice” does not preclude the savvy use of modern means to propagate the incongruous message. Indeed, as noted in the paper, the “Salafist presence in Egypt has been further cemented lately through Salafist religious satellite channels such as al-Rahma (Mercy), al-Annas (People), al-Majd (Glory), al-Hikmah (Wisdom) and al-Fajr (Dawn).” The Salafist appreciation for modern media and marketing strategies seems to include a strong preference for Orwellian brand names, and accordingly, the newly established Salafist party is named Al-Nour (Light); it has emerged as the strongest member of Egypt’s Islamist bloc that garnered almost 28% in Egypt’s parliamentary elections. One can hardly expect anything else from a fanatic who advocates atrocious punishments for his own society. That’s Israel’s Islamist neighborhood – and anyone who ignores the widespread social acceptance of such brutal practices in the Middle East will have a hard time to understand the region. The decisive issue for us has to be the attitude of Islamic political parties towards democracy. Are these Islamic democratic parties, in the sense in which the European political spectrum naturally includes Christian democratic parties? I am confident that an Islamic orientation can be linked with democratic convictions, that Islam can be compatible with democracy. Unfortunately, there is little justification for viewing the Brotherhood as the Muslim equivalent of Europe’s Christian Democrats. Allah is our objective; the Prophet is our leader; the Quran is our law; Jihad is our way; dying in the way of Allah is our highest hope. God is our objective; Jesus is our leader; the Bible is our law; crusading is our way; dying in the way of God is our highest hope. But when it comes to parsing holy writ, there is one big difference between Islam and most other text-based faiths. Barring a brief interlude in the ninth and tenth centuries, and a few modern liberals, Muslims have mostly believed that the Koran is distinct from every other communication. As God’s final revelation to man, it belongs not to earthly, created things but to an eternal realm. That is a bigger claim than other faiths usually make for their holy writings. The Koran may be interpreted but from a believer’s viewpoint, nothing in it can be set aside. Yet, at least in the calm, superficially courteous world of Western academia, debating the precise text of the Koran is increasingly common. It is misleading to compare the Quran with the Bible. For most Muslims, the Quran is “inerrant” to a degree far beyond the understanding of this term by even very conservative Christians or Jews. It has been suggested that Christians, rather than comparing the Quran with the Bible, should compare the Quran with Christ […]The debates as to whether the Quran was eternal or created began at some time in the first century after Muhammad’s death. I think that the majority view ever since has favored the eternity of the Quran—it was with God from the beginning […] If the Quran is co-eternal with God, it has a higher degree of literal infallibility (“inerrancy”) than if it is a creation of God. While Berger ultimately concludes that it “is important to understand that those who wish to combine their Muslim faith with aspirations toward liberal democracy have decidedly Islamic ideas to support their agenda,” his discussion also makes it very clear that it is only a tiny minority of Muslims that would regard these ideas as “decidedly Islamic.” In other words, it is a fringe phenomenon that is extremely unlikely to go mainstream any time soon – and that is another major reason why Islamists like the Muslim Brothers should not be mistaken for Christian Democrats.